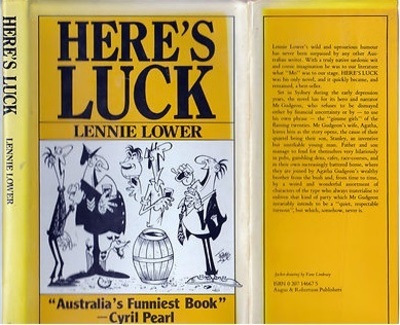 Here’s Luck, a book written by Lennie Lower in the 1930’s offers a comical glimpse into Australian family life during the Great Depression. This isn’t a book I would typically pick up if I saw it in a bookshop or at the library. However as luck would have it, this historical comedy was stashed away in my grandfather’s study. From experience, all books worth reading are found in stash piles or carefully stored in boxes. So my fourteen year old self picked it up and the words “Australia’s funniest book” leapt out at me. Ok then. Maybe I would give it a burl. I opened the page and was instantly captivated by the main character, Gudgeon bemoaning the impetuousness and uselessness of his son, Stanley. The story goes on to create a tapestry of what happens when the missus gets pissy with her good for nothing husband and darling son, and goes to stay with her family (leaving said husband and son to fend for themselves). There are quirky Aussie escapades, brawls, trouble with the law, trouble with the bookies, skirt hunting, bacon and eggs, long lost uncles, boozin’, and motorbikes through windows. And of course, don’t forget the burning down of just about everything. What an epic ending! One of the defining features of this book is the predominantly Australian flavour of humour the narrator creates for the reader. See the thing about Australian humour is that it can be very cynical and droll, confusing tourists to no end. Tourists often can’t believe what they are hearing but we Aussies are so good at being offhand and casual that they can’t help but believe it. Meanwhile the rest of us are laughing it up at the local pub over how gullible the turkeys are. What sets Here’s Luck apart from most comedies I have read, is that there is amusement to be found on every single page of this book. What better way to get a feel of what Australia was like in the 1930’s, and an insight into the dry humour found in many of our older generation? My copy is now severely dog-eared, having been read many times since I was 14. It is hard to acquire a copy of this book these days but as luck would have it (again), the book is available for free, on Project Gutenberg (probably because it is so old and people consider it outdated). For these of you who are Australian, think like an Australian, walk like one and talk like one, you’ll definitely love this book to dog-eared pieces. For the rest of you, if you aren’t amused by chopping down bathroom doors or letting your ungrateful 17 year old cop it for your degenerate ways (cos he deserves it, and you deserve getting off scot-free given what you insufferably put up with as his parent), this probably isn’t the book for you.